【Perfect for Observation】 70mm Telescope with interchangeable 6mm (60X) and 25mm (14.4X) eyepiece lenses,1.5X erecting eyecpiece and 3X barlow lens is professionally for terrestrial and astronomical observation. 【Clear Views】 Fully coated,High quality optical glass lens with high transmission coatings increase brightness and clarity creating stunning images. 【Specification】 Aperture: 70mm(2.75″).Focal Length: 360mm.Focal Ratio: f/5.1. Eyepiece:6mm & 25mm. Prism: 90°correct image prism diagonal. Finderscope:5×24. 【Quick and Easy No-Tool Setup】 The assembly is easy.Including portable telescope fittings inside and custom backpack is conveniente to travelling and storage. 【Note】 Never look at or near the sun through a telescope at any time.Looking at sun can cause permanent blidness or serious eye damage. Pointing the telescope directly at the sun may also cause the internal damage to the telescope. Bright image quality and high magnification power.This telescope is suitable for terrestrial and astronomical observation. It helps you open the door to the field of astronomy and explore the mystery of the universe. It is perfect for beginners, but also offers enough power reserves to satisfy the interests of advanced Astronomy lover. K25mm, K6mm High quality optical glass lens with magnification of 14.4X and 60X. The erecting eyepiece not only can increase the magnification by 1.5X but will corrects the image for terrestrial viewing so that your views are correctly oriented. The 3X Barlow lens can triple the magnifying power of each lens, make it easier to focus moon and stars. The telescope is equipped with an azimuth mounting.You can move the telescope up and down using the pan handle for easy pointing to located objects. ● Prism: 90°correct image prism diagonal. 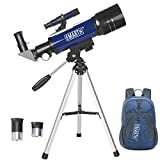 This entry was posted in Astronomy Products and tagged Apeture, EMARTH, Finder, observation, Partner, Refractor, Scope70mm, ScopeGood, TelescopeAstronomical, TelescopeTravel, Tripod by Celestial World. Bookmark the permalink.